The Society of St. Vincent de Paul Exeter will be featured in a special episode on Eternal Word Television Network (EWTN) titled, “Our Faith in Action: Today’s Society of St. Vincent de Paul” on July 27th at 6:30 PM (EST) on channel 56. The story highlights the Eat Right Tonight Program that helps individual and families by promoting healthy eating on a budget and from food available at the Food Pantry. 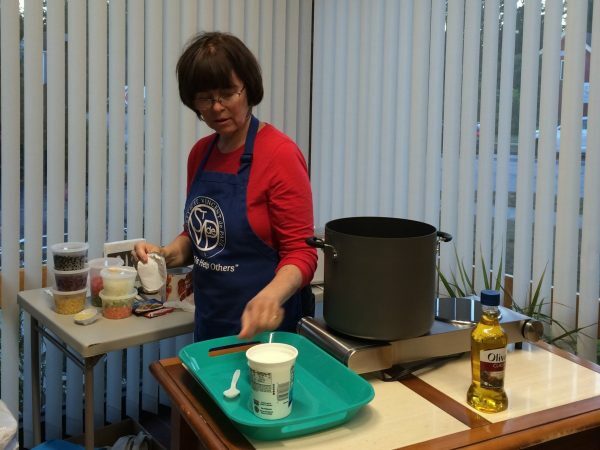 Volunteer Lesley Morgan prepares a health featured meal.